Hyacinths are extremely popular garden plants. One reason is the genus' wide assortment of flower colours. Another reason is the scent that is so highly praised by flower and plant enthusiasts. Completing the picture of the perfect bulbous plant, is the fact that hyacinths are very easy to bring into flower. 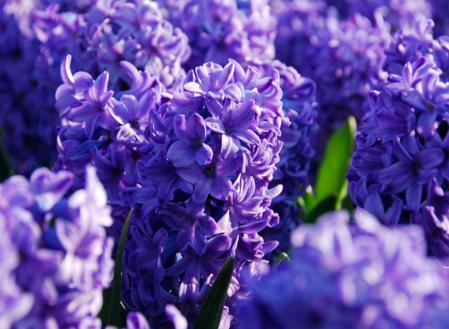 Originally, hyacinths grew only in the lands around the Mediterranean Sea, especially in Turkey. Not surprising then, the species which is the ancestor of all the cultivated varieties has been named Hyacinthus orientalis. The cultivating of hyacinths in Holland goes back more than 400 years, but they were also a familiar plant in the Greek and Roman periods. The 17th and 18th centuries were times of intense speculation in hyacinth bulbs. Occasionally, a single bulb would sell for 300 dollars, a lot of money in those days. The propagation and cultivation of the hyacinth bulbs themselves is uncommonly complicated. Much professional experience and special soil is required for good results, and the Dutch growers have been successful in their attempts. Growing them to produce flowers, either indoors or in the garden, however, is very simple. 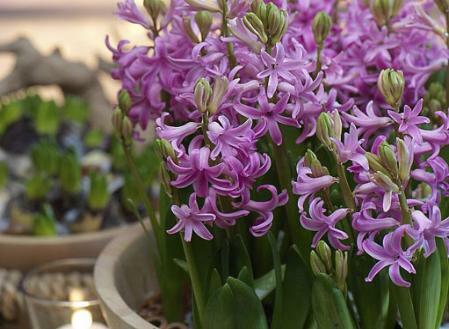 Hyacinths require a well-drained soil. If they must be planted in heavy soil, it would be a good idea to mix some sharp sand into the soil. Hyacinths like a sunny location but since the bulbs are frequently treated as annual plants (meaning that the bulbs do not have to recover for another season's flowering) they can also be planted in spots that are somewhat more shady. An advantage here is that their flowers will last longer than they would in the hot sun. The number of florets on the flower stalk depends on the size of the bulb. Large bulbs can produce 60 to 70 florets. For garden planting, however, such bulbs are less suitable because the flower stalks become top-heavy and fall over easily. Sizes 15-16 and 16-17 are best for garden planting. The large sizes, though, are eagerly sought for indoor forcing. Even though hyacinth bulbs are usually used only once, sometimes it is worthwhile to leave them in the ground for a year or two. When they bloom again, their flower clusters may be a bit smaller than in the first blooming season. To allow for good growing conditions, the plants must be given the opportunity to wither back completely. For flower containers, we should select plants that have short, sturdy stems. Long-stemmed tulips and tall narcissi ‘lower the boom’ easier and fall over. Hyacinths, however, seldom grow taller than 20 to 30 cm. and are perfect for container planting. Containers come in every possible - and impossible - size and shape. They are also available in various materials. To be assured of being able to maintain the proper planting depth and to safeguard the development of the bulbs, such a container should be at least 30 cm. deep. Always make sure that the containers have sufficient drainage holes in the bottom of the pot and possibly low on the sides, too. Placing pot shards or - even better - clay granules, in the bottom of the pot is recommended. Use ordinary potting soil, possibly mixed with 1/3 sharp sand or garden soil that is not too heavy. Fill the container up to about 15 cm below the rim with soil and press the bulbs carefully into the soil. Place them so that they are almost touching one another to produce a massive colour effect. Then put the rest of the soil in, preferably up to within 1 centimetre below the rim. Do not forget to provide water if the weather stays dry for a long time. (This only applies to periods of temperatures above freezing, of course.) Previously mentioned was the fact that hyacinths can suffer damage from extremely low temperatures, so it should be obvious that this will apply even more so to hyacinths planted in containers. After all, the cold can penetrate from all sides. If you expect a really hard freeze, placing the containers temporarily in a place where they will not freeze is highly recommended. Naturally, this should not be a spot with a high temperature. If the containers are difficult to move, or if one lacks a frost-free space, wrapping the containers in plastic bubble-wrap can be considered. It is always desirable to cover the soil with some straw, reeds or leaves. To keep the container attractive over a longer period, winter-flowering pansies or forget-me-nots can be planted over the hyacinths. Japanese ornamental cabbage is another possibility. When the hyacinths are going to emerge, however, they should be trimmed back but not pulled out, as this could damage the bulbs. Hyacinths in containers can also be combined nicely with a single or double early tulips and small narcissi such as ‘Tête à Tête’. Hyacinths have a delightful fragrance - a characteristic that has been a determining factor in its success as a garden plant and a houseplant. This scent is usually described as rich or heavy. Other spring-flowering bulbous plants that have delightful scents are Crocus laevigatus, snowdrops (! ), snowflakes, and a whole series of narcissi. One of these, ‘Paperwhite’, is the most attractive as a houseplant. Besides this one, ‘Cragford’ and ‘Geranium’ (both of which are Tazetta daffodils) and various cultivars from the Triandrus Group (‘Angel Tears’) smell delightful. Crown imperials, grape hyacinths, Iris reticulata, Spanish bluebells, and even certain tulip varieties (the single early, yellow ‘Bellona’) have scents that are not to be sneezed at. About 100 cultivars are cultivated, but fewer than 25 of these individual cultivars represent 90% of the total world production. Hyacinths are often used in small groups of 3 to 5 bulbs of one cultivar, or are planted in larger groups or in beds using either solid or mixed colours. 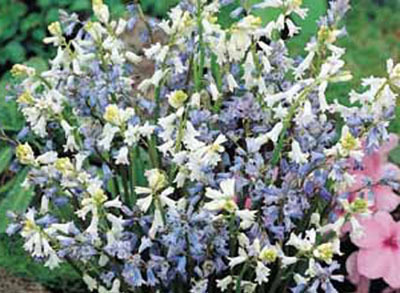 This plant is very similar to 'bluebells' and has no more than 20 tube-shaped flowers dangling from one stalk. Actually, since this plant is not a different species, this commonly used name is botanically incorrect. Bulbs bearing this label, however, have undergone a special treatment so that they will yield not just one flower cluster to a bulb but several. Each of these flower stalks has fewer florets, but the plant as a whole is quite lovely. Below you can find some of the Hyacinth varieties for sale in our webshop.